Squire Theo Rocque is a Breton squire who came to Murcien's Hamlet with the soldiers from Evermore to fight the invading Reachmen, a mission which went disastrously. After his commander, Sir Etienne Hu, was injured, he took command and is trying to make the best of a bad situation. Squire Theo fought the Reachmen forces who came with the Black Drake during his invasion of Bangkorai thirty years ago. He was greatly effected by his experiences and does not see glory in battle. You can find Squire Theo on the docks behind some barricades with the other survivors. "Did they send anyone else from the city? No, I can see you're not part of the Evermore's militia." I hear you're looking for reinforcements. "Yes, I am. Sir Etienne brought us out here, and when he was wounded, I took command. I've secured a fallback perimeter, such that it is. The Reachmen are leaving us alone for the moment." "First, I need to listen to the village elder, Medya Zurric. She may have news about Sir Etienne's condition. And then, yes, I do need help to deal with this situation. Stay right here." Medya the healer will approach Squire Theo with some news. Squire Theo Rocque: "Medya, what is it? Is Sir Etienne all right?" Medya Zurric: "He's doing fine. And when he returns, you all will leave?" Squire Theo Rocque: "We'll stay until Murcien's Hamlet is free, or Sir Etienne and I both fall in the fight." Medya Zurric: "I see. Well, he'll be resting comfortably soon, don't you fret." Medya Zurric: "I'll go see to the poor knight now, then." Squire Theo Rocque: "Good. Good, he's all right. Now, let's go over what we need." After learning about Sir Etienne's well-being, Squire Theo will be ready to give you further instructions. "Sire Etienne is all right. That puts my mind at ease. Now I do need your help. This is more of a challenge than I expected." "We arrived with our horses on those merchant ships, along with Sir Etienne. Maybe it was rash to go against our orders and come here in defense of simple villagers. I won't presume to judge the actions of the men and women who died for our cause." What can I do to help now? / I see. What can I do to help now? "You've the look of an experienced combatant. Hold the line while I check on Sir Etienne at Medya's home. The witchmen seem content to ransack the village for now, but be ready for anything." I'll take care of things. How did the witchmen succeed? "Just as they were thirty years ago, the madmen … they used the trees, rocks and homes here to out-maneuver our horses. I haven't ridden since the Black Drake's war, it's one of the only reasons I survived this skirmish." You've been a squire for more than thirty years? "The things I saw during the Black Drake's invasion … they kept me from the purity of heart required to be a knight. Others managed. Not me. I've been plagued by doubts and anxiety ever since then, like an immeasurably heavy stone around my neck." You fought in the war against the Black Drake? 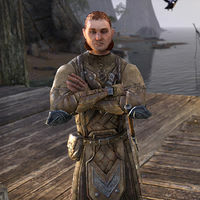 "If you wish to hear stories about the great war the brought the Daggerfall Covenant together, talk to someone else. All I remember is the blood and the death, the desperate battle to save the life we knew and the lands we loved." Not many speak of their part in a war. "That's because war is like a plane of Oblivion. If you haven't been, you can't fathom what it must be like. And if you have, it's not something you wish to relive." Squire Theo in Medya's home. After you have checked the fortifications and fought off the Reachmen trying to breach it, you can go to Medya's home on the north side if the village. 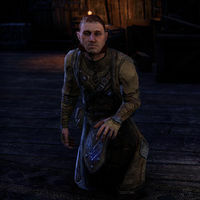 Squire Theo can be found there, looking down in shock at the corpse of his commander and with Medya nowhere to be found. "How could this be? All he needed was a splint for his leg after his horse fell on him, and now he's dead! Why would someone kill him?" That's not a Reachman's weapon, either. "It's his own sword. I shouldn't have left him alone. Please, look around to see if there are any traces of his killer?" Wasn't the local woman, Medya Zurric, looking after him? "Yes, but she wasn't here when I arrived. She may have gone out to find a poultice, or herbs, or whatever she needed to treat his pain. I hope she's all right, though she should've waited for me to get here before leaving Sir Etienne alone." Once you have discovered various clues around the house, you can tell Squire Theo about your findings. "Have you found something? Anything to indicate who killed Sir Etienne?" I've found some possible clues. "I could help you figure out what happened here, if you tell me what you've found. I might not have your eye for detail, but I knew Sir Etienne well." Let's talk about the murder scene. "Sir Etienne doesn't look like he put up a fight. That's not like him, even if he was hit from behind. His leg's been tended to. Looks like he was attacked while eating. What else?" 'There were two other people with him, based on the dishes. He trusted the people he was with." "He didn't know anyone here, that I know of. Who could he possibly trust enough to lower his guard?" I don't know. He was also stabbed through his breastplate. "That would take a lot of force, all things considered. Sir Etienne's armor was in fine shape. His squire would see to that." There are signs Sir Etienne had received treatment. "If that proves anything, I think it shows that the only person who didn't kill him was Medya. Why treat someone if you expected to kill them?" I also found signs that whoever killed him must have washed up here before leaving. "So they were comfortable, or in no hurry. Perhaps Medya washed her hands before going outside. They say the witchmen lust after the scent of blood." The murderer didn't hide anything here. "So they weren't concerned that Medya or I would discover what happened? Either that of they just didn't care if anyone found the scene, assuming that it would blend in with the carnage outside." I found the village records from the time of the Black Drake's attacks. "I'm sorry, but I don't see how that could be related." The rest of the records are on the shelf. This was on the floor, as though someone had just read it. "Do you think Sir Etienne was reading the book when he was killed? That's a pretty dry topic to just pick up for no reason." Maybe. It showed Medya has a son named Labhraidh after Black Drake's push through here. "She hadn't mentioned having a son. Hardly damning evidence, though." We need to find Medya. Either she's dead too, or she knows who did this. "I find it hard to believe that a goodly old midwife would have anything to do with this heartless slaughter. Her apprentice Rolbert Foucher is down by the docks. I imagine he would be a good place to start asking questions." We'll find out when I track her down. After finding evidence that Medya is working with the Reachmen and her son, you can return to Squire Theo. As you reach the door, you will hear him shout out a warning. Squire Theo Rocque: "Medya's here! Come quickly, she's not—"
When you enter, Labhraidh will be standing over Theo's unconscious body. Once you have defeated Labhraidh, Squire Theo will come to. Squire Theo Rocque: "What happened?" Squire Theo Rocque: "You killed him, didn't you." You can then speak with him, where he tells you he needs your input to make a choice. "I cannot trust myself to make this choice, the loss of Sir Etienne is too near to my heart." "She was in league with them! Her own son led them here to Murcien's Hamlet, and she let Sir Etienne die! What choice do you think I ask you to make?" Let's consider what we know that she's responsible for. "The woman is the Hamlet's only healer, she volunteered to take care of Sir Etienne. She knew how to save him and she chose not to. Her son was with the Reachmen that raided Murcien's Hamlet." I don't want to make this choice. She should stand trial for what she's done. "Yes … yes. You're right. Of course she should stand trial, so that the people of Evermore can know what happened here." "I will. Once I've made arrangements, we will return to the city with our captive. She was a good woman once, and in many ways still is. Whatever her fate, as it comes through my decisions, she deserves to look me in the eyes as it happens." "Medya allowed her son to kill Sir Etienne, but you are right in requiring a trial before she is put to death. Evermore's people need to hear from her own traitor's lips what happened here—and why it happened!" This page was last modified on 29 December 2018, at 14:31.